Catch the number 32 bus from Ross and alight at Hill Top, Upton Bishop. Bus fare payable on the day, English bus passes accepted. A moderate walk around Hartleton Lakes and along the Rudhall Brook takes us back to Ross in time for afternoon tea. Leader: David Collin, Ross-on-Wye Group Ramblers. Walk 2. Through the Hole in the Wall. This is a moderate, circular walk near Ross. It follows a section of the Wye Valley Walk alongside the river Wye through the quaintly named “Hole in the Wall”. The return route offers lovely views across the Wye Valley towards the Black Mountains. Time: 1.00pm returning about 4.30pm. Wander around the local food providers in Ross town centre. Taste specialities unique to Ross and the surrounding area. Your guide will also be able to fill you in on some of the vast history of Ross between tastings. For legend see top of page. The Three Castles walk is a circular walk of about 19 miles, set on the borderland of England and Wales. The three castles of Skenfrith, White Castle and Grosmont were built by the Normans to defend the Monnow Valley against the marauding Welsh. The 19 miles of the walk will be undertaken in 2 stages. Stage 1 starts at Skenfrith Castle alongside the river Monnow. Skenfrith, peaceful now, has a 13th Century church that contains a 15th Century Cope and has a wooden belfry. Today’s terrain, on the way to White Castle (entry fee charged), is mainly meadows and valleys (many stiles). The route has many good views and uses part of an old stagecoach route. The first day ends just short of Graig Hill with 11 miles covered. Transport will be provided back to Skenfrith. Walk 2. William & Kate’s Future Home? An easy walk across farmland to Hoarwithy’s famous Italianate church then back through Harewood Park (Duchy land) viewing possible site for a rebuilt Harewood House for the Duke and Duchess of Cambridge. An opportunity to see some of the extraordinary industrial heritage of the Forest of Dean. See Roman, or even pre-Roman iron workings that may have inspired the Lord of the Rings stories. Visit the partially restored iron works that produced some of the rails for our early railways. Find out how to become a Free Miner and pass long abandoned coal tips. All this, as you pass through some of the loveliest forest landscape. A route along country lanes, the bank of the River Wye and fields. Some relatively moderate climbs along two stretches. There will be an opportunity to visit the “Italianate” style church of St. Catherine’s in Hoarwithy and the historical churches in Kings Caple and Sellack. Finish at the New Harp Inn where refreshments and/or lunch can be taken after the walk. Starting at Skenfrith Castle there is a long, steady ascent alongside the river Monnow to White Rocks, then a steeper ascent to the summit of Garway Hill. Here are fine all round views – look for the Black Mountains, the Malverns and May Hill. The return is via Garway Church (with its amazing Norman Arch and connections with the Knights Templar) and dovecote. Today’s walk is a little stiffer with two good climbs. The first climb ascends Graig Hill for great panoramic views from the top. The path then traverses woodland and farm tracks to the beautiful, sleepy village of Grosmont. Its castle sits on a commanding mound overlooking the Monnow. After leaving Grosmont the route climbs through fine deciduous woodland before the steep descent back to Skenfrith. Route starts from Bromsash on The Ross Round (fine views over Ross and Welsh Mountains beyond), past Bolitree Castle (Richard Hammond’s House) to Weston-under-Penyard, past a Norman church, skirting Penyard woods, onto Dancing Green and Pontshill passing Handley (birthplace of Ann Greening – mother of Elgar), along the remains of the Roman Road from Ariconium (Weston-under-Penyard) to Blestium (Monmouth) where part of the cobbled surface and bridge over the stream can be seen. Through Weston and return via site of Ariconium settlement back to Bromsash. Optional tea and cake at Eastview, Bromsash at end if you wish. A satisfying journey around the local hills, woods and valleys. Includes a pause halfway at a church and a pub for those whose senses thirst! Leader: Judith Stares, Ross-on-Wye Walking Group. Not suitable for dogs. Bring a picnic. A woodland walk, in the depths of the Forest of Dean, starting from New Fancy car park and going via Parkend, Moseley Green and Blackpool Bridge, with its Roman road, and the Drummer Boy stone. Walk 5. The Last Cream Tea of Summer. Walk along field paths and lanes to the cider orchards at Broome Farm. Enjoy a superb Cream Tea (£5 per person, payable on the day) before returning to Ross. Time: 1.30pm returning about 4.00pm. Booking Fee for all walks is £3 except the foodie walk on Friday 28th September. Please arrive at the meeting point at least 10 minutes before the start of each walk. This is especially important for walks that include a bus or train journey. Walks will commence at the given time, whether all participants have arrived or not. Please note the finishing times for all walks are approximate. The walk leader will be at the meeting place whatever the weather. However, in exceptional weather conditions, the walk may be re-routed or cancelled to ensure your safety. Well behaved dogs are welcomed on some walks. Dogs must be kept on a short lead at all times. Walks are not guaranteed to be dog friendly; you may need to help your dog over stiles. The booking fee – £3.00 per adult per walk – is non-refundable. If the booking includes additional payment for transport or a meal, we will try to re-sell your tickets, provided you notify us of cancellation no later than 21 days in advance of the walk date. However, our own unsold tickets will take priority. A £1.00 administration fee will be charged per ticket resold. Any cancellations within 21 days of the walk will not be refunded. Please inform us of any cancellation as soon as possible, since many of the walks have a waiting list. Ross-on-Wye Walkers are Welcome Steering Group reserves the right to alter this festival programme without prior notice. The details in this programme are believed to be correct at the time of going to press. Ross-on-Wye Walkers are Welcome Steering Group has endeavoured to ensure the safety of all festival participants. It cannot, however, be held liable for any injury or loss of, or damage to, personal property, however caused, except to the extent to which it is unlawful to exclude such liability under the applicable law. You are advised to take out insurance against accident and personal injury. Telephone 01989 562768 and if ‘phoning, please remember to have a debit/credit card to hand to pay for your ticket. 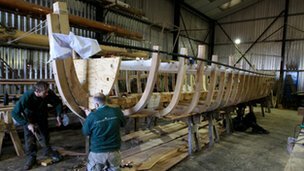 The Wye Trow being built to represent Herefordshire in a pageant on the Thames to mark the Queens Diamond Jubilee is taking shape. And now the captain of Ross Rowing Club, Jeremy Picton-Tuberville, who is the Wye Trow Rowing Director, is inviting applicants to crew this prestigious craft. The Wye Trow will carry a complement of 14 people, including the oarsmen/woman, who will row the craft from fixed seat positions using 15ft oars. It is expected that they will be dressed in period costume and the distance rowed is likely to be between 11-15 kilometres (which will take between 1 ½ and 2 hours). The Lord Lieutenant of Herefordshire, Lady Darnley, will be on board the Trow when it joins 1000 other water craft on June 3rd for what will be the biggest pageant of boats and ships the River Thames has seen for many centuries. The Wye Trow project team is looking for athletes from Herefordshire to put their names forward for selection into a team of rowers to train for and take part in this historic event. A squad of 16 oarsmen and woman will be selected from the volunteers to attend trials and crew training on the Sharpness Canel in Gloucester in April and May. From this squad, eight will be chosen to row the Wye Trow at the Pagaent. The basic requirments for the trow rowers are: Must be aged 16 or more: Must be an experienced rower. (Fixed seat rowing experience an advantage but not essential); Good reach and flexibility; Excellent level of fitness; Must be available for crew training (likely to be in the first two weeks of April and the second week in May) and the Pageant weekend (May 31st to June 4th). Applicants are invited to write to the Wye Trow Rowing Director summarising how they meet each of the basic requirements and adding briefly any other information they wish. The address to write to is: Jeremy Picton-Turbervill, Coughton House, Coughton, Ross-on-Wye HR9 5SF or by email to jeremypt@hotmail.com.